GardenSMART :: Will This Strong El Nino Take Away Your White Christmas? Will This Strong El Nino Take Away Your White Christmas? The El Niño of 2015 is one of the strongest on record, dating to 1950, and, by some metrics, may already be stronger than the previous strongest El Niño of 1997-1998. This periodic warming of the equatorial eastern Pacific Ocean can have a number of effects on weather around the world, from heavy rain to extreme drought, persistent warmth to stubborn cold, and inactive versus hyperactive tropical cyclone seasons. 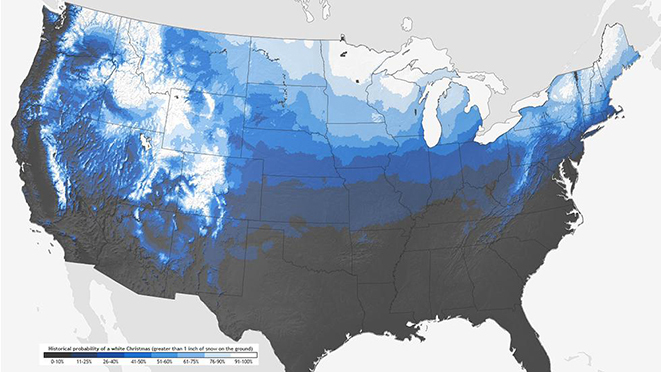 Given its strength, will this El Niño factor into your chances of seeing a White Christmas? First, it's worth noting that meteorologists define a White Christmas as one in which at least one inch of snow is on the ground on Christmas morning – and they aren't as common as you think, even in colder climates. 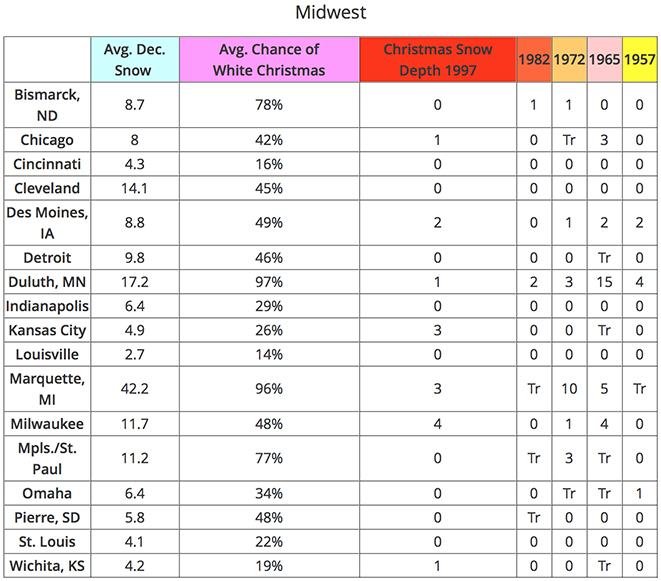 Even in areas you expect a White Christmas to be a slam dunk, the chances aren't 100 percent, such as Minneapolis/St. Paul (77 percent) and Burlington, Vermont (72 percent). With that context, let's first examine what happened in December during the previous five strong El Niño events. Strong December El Niños were in place previously in 1997, 1982, 1972, 1965 and 1957, based on the categorization by Jan Null, a consulting meteorologist with Golden Gate Weather Services. It's important to note El Niño and its opposite, La Niña, is not the sole driver of the atmosphere at any time. One other atmospheric influencer during the winter months, known as the North Atlantic Oscillation (NAO), can lock cold air into the U.S., regardless of El Niño or La Niña. Day-to-day and week-to-week variability in the weather can still deliver a potent snowstorm in a location where a season-long El Niño would work against that. Think of El Niño, then, as just one factor loading the dice for or against a White Christmas. Putting all the previous strong El Niño Decembers together, you'll note the widespread warmth over most of the eastern two-thirds of the nation, from the High Plains of Montana to New England. Not a good sign for snow either falling or remaining on the ground. However, this is an average of those five Decembers. Not all of those were warm. December 1972 was quite cold over the Plains, Upper Midwest and northern Rockies. However, note the average precipitation over those five Decembers was wetter than average not just over where you would expect it in a strong El Niño – namely, the nation's southern tier – but also in a ribbon extending northeast into the Mississippi Valley and western Great Lakes. So, at least historically speaking, there's a better chance of December precipitation that, if the air mass happens to be cold enough at that time, could fall as snow. 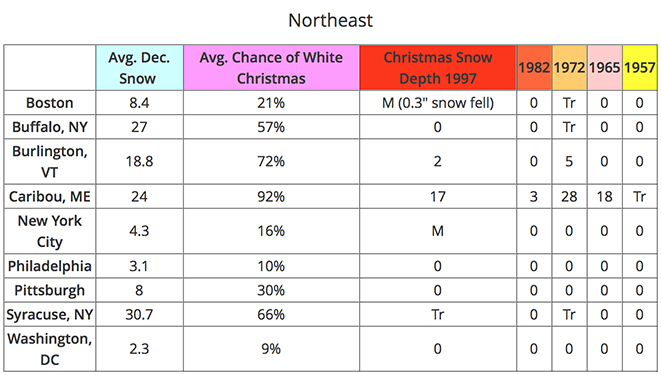 Now let's examine city-specific statistics by region to see if there has been a reduction or increase in your Christmas morning snow cover in strong El Niños. 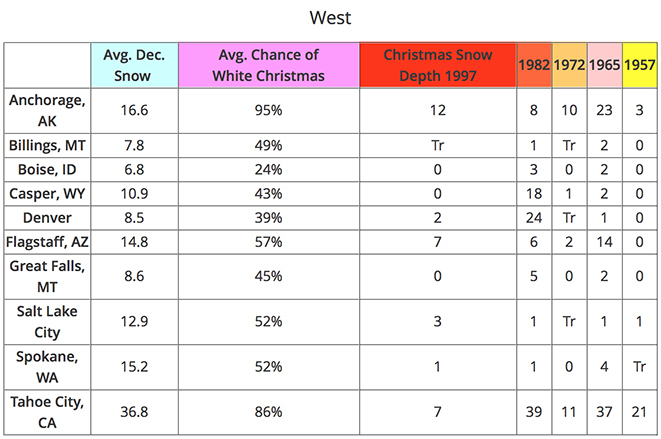 In each column you'll see average December snowfall, the average chance of a White Christmas in any year, and snow depths on Christmas morning during the previous five strong El Niños. "M" means data is missing from the climatological record and "Tr" stands for a trace of snow, defined as less than 0.5 inch. It's no surprise most of the Northeast Megalopolis sees bare ground on Christmas morning. Their chances of a White Christmas are only roughly 10 to 20 percent even in the absence of a strong El Niño, and they don't typically get a lot of December snow anyway. What is impressive, however, is the snowpack squelching power of strong El Niños in the Great Lakes and even parts of northern New England. 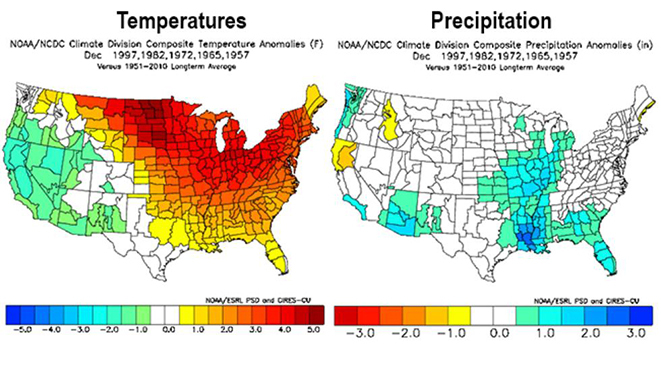 Note Buffalo has not had a White Christmas in a strong El Niño dating to 1950. The same is true for America's snowiest large city, Syracuse, New York. Even Burlington, Vermont, has seen snowless ground three of the five strong El Niño Christmas mornings. Cleveland and Detroit may have a cold, snowy reputation, but neither city has had a single White Christmas during a strong El Niño in 65 years. Three out of four Christmases, on average, have at least one inch of snow on the ground in the Twin Cities. But only one out of five happened during strong El Niños, in 1972. Perhaps most impressively, Marquette, Michigan, averaging 42 inches of snow each December, failed to produce a White Christmas in two of five strong El Niños, most recently in 1982. Thanks to Flagstaff, Arizona's elevation (around 7,000 feet), they already have a better than 50/50 chance of a White Christmas in any year, including an eight-year streak from 2006 to 2013. The bullish subtropical jet in a strong El Niño typically enhances the northern Arizona city's White Christmas chances. Only the 1957 strong El Niño featured a bare-ground Christmas, there. You may note an extreme outlier snow depth in Denver during the 1982 strong El Niño, courtesy of the infamous Christmas 1982 blizzard. Despite this seeming outlier, a UCAR/COMET study originally done in 2009 by Weather Underground meteorologist Bob Henson and updated in 2015 by Matt Kelsch for nearby Boulder, Colorado, found a 20-inch-plus snowstorm, there, is about four times as likely during an El Niño than a La Niña. Finally, note that not all strong El Niños dump heavy snow in the mountains of California in December. Typically, January and February are heavier, precipitation-wise. But note the heavy Christmas snowpacks at Tahoe City in three of five previous strong El Niños. As investors often say, "Past performance doesn't guarantee future returns." While the historical probability of seeing bare ground or a snowy scene reminiscent of a Christmas movie may be affected by a strong El Niño, it is just one factor at work in our complex ocean-atmosphere system. Jonathan Erdman is an editorial meteorologist at weather.com and has been an incurable weather geek since a tornado narrowly missed his childhood home in Wisconsin at age 7. Jon completed his Master's Degree in Atmospheric Science from Colorado State University in 1996 with an emphasis on dual-polarization radar.